Read our 2017-2018 Annual Report to learn how your support impacted Nashville Ballet. Nashville Ballet's dancers bring their talent and passion to stages across Middle Tennessee, from TPAC’s performance halls and audiences of thousands, to community centers and public libraries where everyone is welcome. With a varied, world-class repertoire, our artists produce unforgettable dance moments to inspire, educate and enhance the Nashville arts community and everyone that experiences a Nashville Ballet performance. As a non-profit performing arts company, ticket revenue and school tuition covers just half of our expenses, which means we need your support to keep our dancers on their toes! View a full listing of our annual donors. Alternatively, please consider supporting one of our special projects below. Friends of Nashville Ballet is a membership group of over 130 young professionals and community volunteers who share a passion for dance and are committed to furthering the mission of Nashville Ballet. Friends provides its members a unique opportunity to engage more deeply with the art of dance through a diverse schedule of social events, behind-the-scenes experiences, volunteer opportunities and performance-related programming. To learn how to join today for 12 months of exclusive benefits, click here. Love Nashville Ballet? Your support makes it all possible! Tuition and ticket sales cover only 60% of our operating budget, and we rely on the generosity of our community to keep our mission alive. Starting at $100 a year (or less than $9/month), you can support our mission as a member of Nashville Ballet and enjoy behind-the-scenes experiences, special event opportunities and more. For a full list of membership levels and benefits, please click here. This year marks Paul Vasterling’s 20th anniversary as Artistic Director! In celebration, Nashville Ballet produced its first-ever gala performance. Your gift in honor of Mr. Vasterling will celebrate his achievements and 20 years of leadership at Nashville Ballet. To make a gift in honor of this momentous occasion, please click here. Share the magic of the holidays! Each year, Nashville Ballet partners with more than 60 nonprofit organizations and provides free Nashville's Nutcracker tickets to the families these organizations serve. With every $30 gift, you can help one child or family member have the experience of a lifetime. Your donation will allow them to experience a live ballet and symphony performance, as well as the joy and wonder of this magical holiday tradition. To learn how to give the gift of Nutcracker, please click here. The Center Stage Club is Nashville Ballet’s campaign to achieve mission-critical support from local businesses and entrepreneurs. We cannot do it alone. Join the Center Stage Club and raise the business barre for the arts to drive social, civic and economic success. To learn more about the Center Stage Club and how you can give today, please click here. Contributing to the endowment for Nashville Ballet is an investment in our future. Like planned giving, endowment giving provides an opportunity to have a long lasting impact on Nashville Ballet. All gifts to the endowment are invested, allowing the organization to draw on growing funds each years to help meet operating expenses. To learn more about endowment giving, please click here. One of the easiest ways to support Nashville Ballet is by making a contribution to the Nashville Ballet Pointe Shoe Fund! Pointe shoes are an essential tool for the art produced by Nashville Ballet. They are custom made by hand, cost an average of $75 per pair and typically last less than one week. Last season, our company members danced their way through 650 pairs! To learn more about the Pointe Shoe Fund and how you can give today, please click here. Nashville Ballet relies on the support of loyal donors to continue our legacy of world-class ballet performances, outreach programs and school training. Planned gifts provide significant support to realize the mission of the organization. When you join the Legacy Circle and include Nashville Ballet in YOUR long-term estate plans, YOUR GIFT extends past your own lifetime to ensure that Nashville Ballet’s tradition of artistic excellence will be preserved for future generations. To learn more about Planned Giving, please click here. The Creation Fund supports the building and creation of original ballet productions. Under the artistic vision of Paul Vasterling, Artistic Director, Nashville Ballet has premiered more than 40 new contemporary works. Your gift to the Nashville Ballet Creation Fund allows you to be a part of the creative process and help us bring exciting new works to the world of ballet. To learn more about the Creation Fund and how you can give today, please click here. Nashville Ballet accepts gifts of cash, check, credit card payment or stock transfer via mail, phone or online. For questions, please contact Nicole Long at Nlong@NashvilleBallet.com. What does your license plate say about you? Even more than your favorite bumper sticker, your license plate can show everyone around you that you support the arts in Tennessee. Any kind of specialized license plate purchased in Tennessee provides vital funding to arts organizations across the state. It only costs $35 a year and 90% of the proceeds from your purchase directly support arts organizations like Nashville Ballet. In 2015, this program provided $4.5 million of the $5.3 million in grants made to over 700 arts organizations in every region of the state. Make your next license plate a specialty plate, or buy a GIFT-A-TAG voucher for another arts supporter, and show everyone on the road that you support the arts in Tennessee. 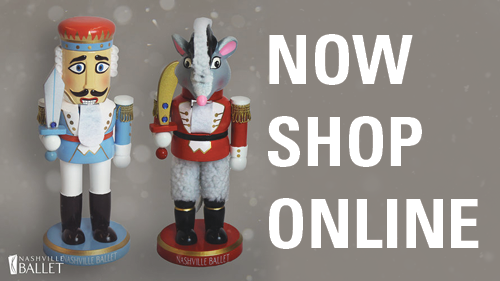 Did you know that you can donate to Nashville Ballet while you shop online? Instead of shopping at Amazon, try shopping at AmazonSmile. It’s the same products and prices, but Amazon donates 0.5% of your shopping total to the charitable organization of your choice. Start shopping at smile.amazon.com and support Nashville Ballet all at once! You can support Nashville Ballet every time you shop at Kroger! Enroll your Kroger Plus Card online at krogercommunityrewards.com and link your Kroger Plus Card to Nashville Ballet (NPO #17529).